Blog — "Saint Nicholas Day"
December 06, 2012 • Heidi Shenk • "holiday" • "Saint Nicholas Day"
Growing up it was tradition that not only did we celebrate Christmas, but we also celebrated Saint Nicholas Day on December 6th. This tradition is where Santa Claus, as we know him, originated. My mom grew up in Belgium and brought the tradition of celebrating Saint Nicholas Day to our family. The night before we would lay out our shoes (or in the normal tradition your wooden clogs). In the morning, there would be small gifts left from Saint Nicholas if you had been good and some sticks in your shoe if you had been bad. Usually we would get a Christmas ornament, some marzipan, speculoos (the most wonderfully tasty spiced holiday cookies you could ever want! ), chocolate, an orange, and that sort of thing. After going off to college, my mom still sent me St. Nick's packages in the mail on December 6th. As I left to go out on my own after college, I still wanted to celebrate the fun tradition, so I still continue to leave a little something for Andrew for when he gets up in the morning. I can see now why my mother probably had so much fun with this tradition. For me, picking out the items to include are so much fun! Here is a look at some of the things I included in Andrew's Saint Nicholas Day surprise this morning. An ornament! 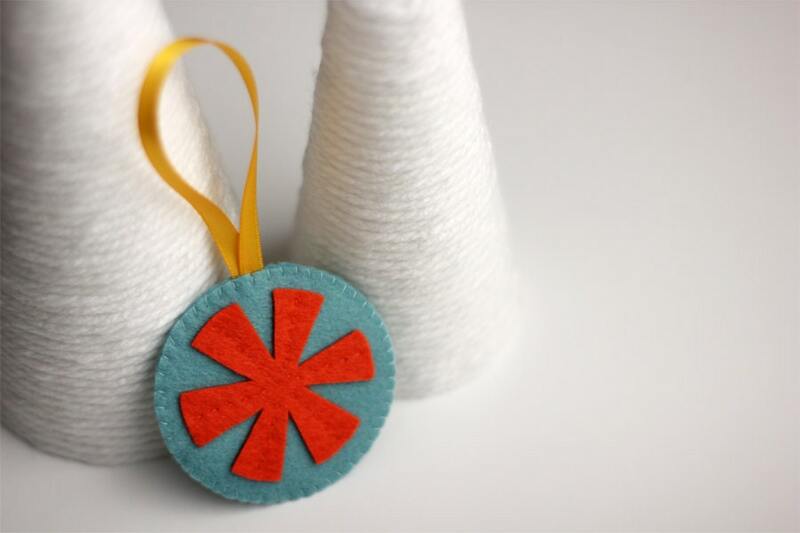 And I found this fantastic handmade ornament from My Hideaway-- perfectly simple and bold in color. It will fit right in with our tree that we'll be decorating this weekend. Mary has so many cute ornaments in her shop, but I loved the color scheme of this one. I like to include tea because it always seems like a cozy thing to have handy in the colder months. Usually I buy Celestial Seasonings, but this year I couldn't pass up this tin and the wintery name of this tea! I added a candle as well for the same reason as the tea. I always associate candles with this time of year. And the coziness factor is much better with a few candles lit around the house. It is ridiculously hard to find speculoos in this neck of the woods, so I went with a few Pepperidge Farm holiday cookies instead. Some Ritter Sport chocolate is a must! And I added an orange to the bag as well. Once I decided what to give Andrew for Saint Nick's Day, I put everything together for him in this fabulous recycled paper holiday bag from Pier 1. And of course, I'll be enjoying the cookies, chocolate, and tea with him! ;) Have you ever celebrated Saint Nicholas Day? What are some of your family holiday traditions?